(Frisco)— Frustrated that city officials are wavering between a permanent toxic landfill and a complete clean-up of the notorious Exide lead smelter site, Frisco residents on Tuesday announced their own do-it-yourself effort to prevent what they say is a second disaster in the making. "At the exact time the City needs a bold and optimistic vision for this huge piece of Central Frisco, our officials seem to be willing to accept the equivalent of a Superfund Site between the new Cowboys headquarters and Toyota Stadium," said Equilla Harper of Frisco Unleaded, the group widely credited with hastening the smelter's demise in 2011. 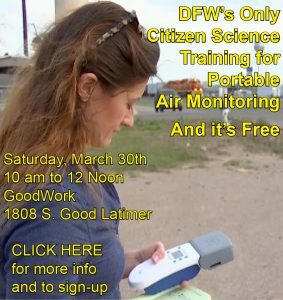 On Saturday November 9th from 10 am to 2 pm , Harper and other members of her group will be set up in Frisco's main square offering residents free access to an XRF lead analyzer and a trained technician for testing objects such as soil from suspected contaminated Exide lead waste hot spots in town, household objects that residents might suspect contain lead like paint chips, pottery, backpacks, and jewelry, and whatever else they want to bring. No blood or bone testing will be offered, but information on how to get such testing will be available. They'll also be sending out small teams of investigators to sweep the city's own 300-acre Grand Park property that sits directly downstream of Exide and has already been confirmed by authorities as a contaminated area. Members will flag and collect suspected battery chips and pieces of lead "slag." It's all part of the group's "community clean-up campaign" meant to put City Hall in the hot seat on the eve of a decision about the Exide property that the residents say could determine the fate of the city's core for decades. Frisco, along with other cities across the country that believe their communities have been damaged by Exide facilities, must submit a monetary claim by December 9th to the judge hearing the company's bankruptcy hearing. Currently, the city is asking for approximately $20 million. That's only enough to build a new toxic waste landfill on the smelter site, beside Stewart Creek and upstream of the city's Grand Park. But according to the city's own engineering consultant, it's going to take $135 million to dig up the lead waste, haul it out and make the property and Stewart Creek safe for redevelopment. Frisco Unleaded wants the city to ask the court for this larger amount for a complete clean-up, and they don't know why Frisco officials are hesitating. "Nobody expects the bankruptcy court to give you everything you ask for. But to get the most money you can, you have to ask for the most, not the least. You don't have to work on Wall Street to know that," said Harper. So far, the city has remained tight lipped about what it plans to do, refusing to discuss the pros and cons in public. 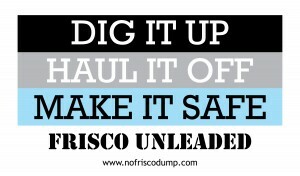 Frisco Unleaded's campaign is meant to bring that debate out in the open. It's a debate the group thinks it can win if Frisco residents are aware what's at stake. 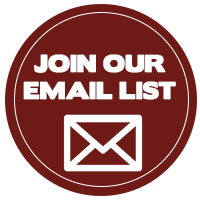 For example, members are arming themselves with information about how much toxic waste landfills can damage property values. "There probably aren't a lot of people in Jerry Jones' Starwood development just down the street from Exide that realize the Council's decision about Exide could significantly affect their home's re-sale value. There's evidence these landfills can negatively impact property up to five miles away" said Jim Schermbeck of Downwinders at Risk, the 20-year old clean air group that sponsored Frisco Unleaded's start-up. There's also the fact that the landfill would pose a constant threat of catastrophic failure to Stewart Creek and Grand Park for the entirety of its existence, as well as the more routine danger of leaks and discharges. "Grand Park will never be Grand as long as there's tens of thousands of tons of toxic lead waste buried upstream, right beside the banks of Stewart Creek," said Meghan Green, a resident who's been involved with the issue for over three years. "We already have parents telling us they'll never use the park as long as that waste remains. That just isn't right and the city needs to realize it's in its best interest for its own citizens to be able to enjoy their own parks without fear of being poisoned." In the last month, a representative of the group has appeared before the City Council twice to request that they submit the larger figure to the bankruptcy court and declare their public support for a comprehensive clean-up instead of the landfill option. Last week a member received a commitment from Frisco State Representative Pat Fallon to draft a new piece of state legislation that would divert more state battery fee money to cover the costs of a complete clean-up of Exide. Green and Harper are clearly frustrated that the city isn't being more vocal about what needs to happen with the property. "We're working as private citizens to try and put together a package with enough money to pay for a real clean-up," said Harper. "We don't see the city getting out front and doing the same thing. They need to show leadership and commit to cleaning-up and developing the site so there's no trace of the Exide smelter left. Anything else allows Exide to keep threatening our community." Previous post: Why Does The Frisco City Council Want to Build a Lead Fukushima in the Middle of Town?